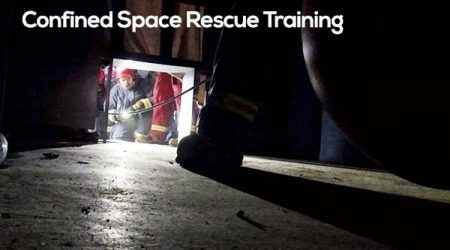 awareness, inspect and maintain equipment, applying proven Confined Space Rescue techniques to confined space operations, rescue knots, mechanical advantage systems, incident command, and how to coordinate with other emergency responders. This training will primarily consist of hands-on field training. All students must demonstrate to the instructor through practical evaluation that he/she is competent before a certificate can be received. This course is somewhat physically demanding and students will be required to demonstrate the ability to operate in small spaces while wearing a full face respirator, mandating a current quantitative mask fit test. Acrophobia and Claustrophobia may disqualify candidates from completing the training. On-site training will utilize the rescue equipment available to the students and will focus on Confined Space Rescue Team training. For on-campus training it is recommended that a current list of confined space rescue equipment be e-mailed or faxed to the instructor prior to the course to ensure the training equipment is as similar as possible to that of the student’s sponsoring organization. Key Topics Covered: Students will learn OSHA requirements for permit and non-permit required confined space training, working with confined space rescue teams, HAZMAT awareness, inspect and maintain equipment, applying proven rescue techniques to confined space operations, rescue knots, mechanical advantage systems, incident command, and how to coordinate with other emergency responders.